Order your own copy of Allies of Necessity at your local retailer or online through our website today! Unlike Rivals, which featured twenty neutral cards, Allies of Necessity features a spread of hero, villain, and neutral cards for every color. (Notably, this only affects constructed play, as cards from any affiliation can be included in your draft deck, making every card in this draft set a viable option.) Within this Draft Set, you'll find a Red hero, a Blue villain, and a Yellow neutral character, and although they maintain different philosophies and moral codes, each character gives you a bonus for playing to their color, and all are valuable assets to your team. Some view Count Dooku as a freedom fighter, others as a political idealist, and still others as a traitor to the Jedi Order. Regardless of their views, no one can deny Count Dooku’s skill in battle. 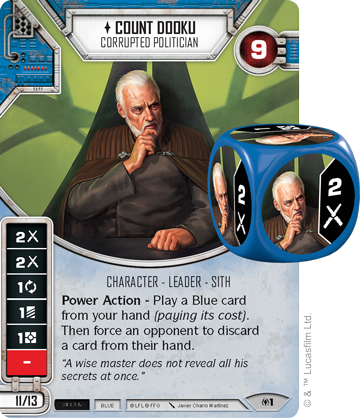 Count Dooku, Corrupted Politician (Allies of Necessity, 1) features two melee damage sides to help strike down his foes, but also features a more subtle form of attack. As a Power Action, you may play a Blue card from your hand, then force an opponent to discard a card from their hand. 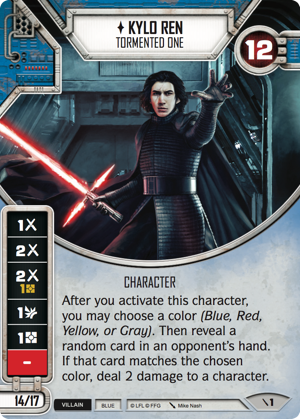 Limiting your opponent’s options is strong, and this ability could even give you some additional information in constructed play for use with Kylo Ren, Tormented One (Two Player Starter, 1). Few are more prepared for war than the Mandalorians. 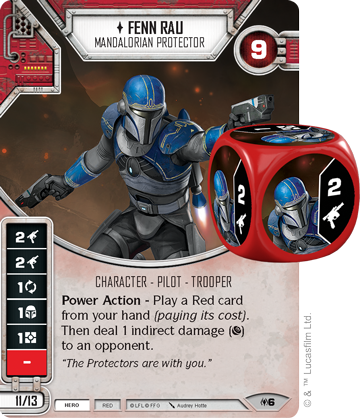 Through the Clone Wars and the early days of the Galactic Civil War, Fenn Rau and the Protectors fought with legendary skill and ferocity. Fenn Rau (Allies of Necessity, 6) enters Allies of Necessity with two ranged damage sides, making him a viable damage dealer who is boosted even further by his Power Action, which allows you to play a Red card from your hand and deal one indirect damage to an opponent. 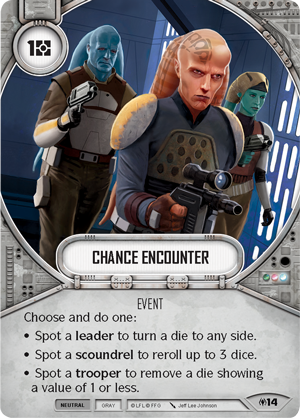 At eleven points for a normal version or thirteen for an elite, Fenn Rau is a low-cost threat in both constructed and draft play. Hero, villain, it matters little to those living on the outskirts of society. The Outer Rim Outlaw (Allies of Necessity, 9) is a scavenger and a scoundrel, but can also be a valuable member of your team. 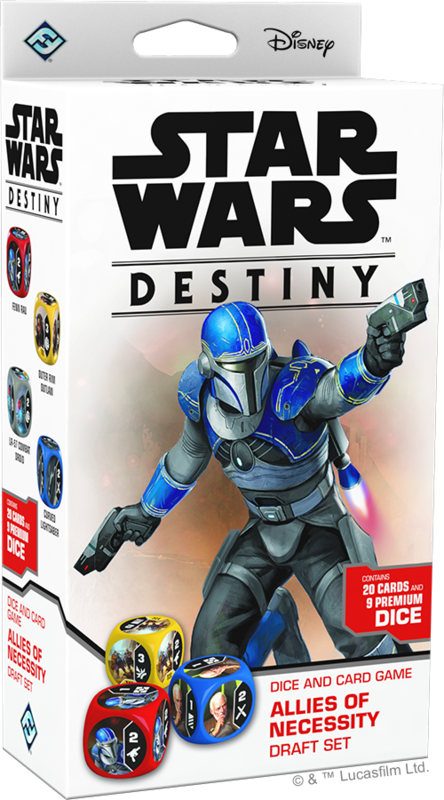 Though the damage on their die is split three ways, you can still find consistent results with their Power Action, which lets you play a Yellow card and reroll an opponent’s die or three of your own dice. This could help fix a bad roll on your side, or eliminate a strong die from your opponent. 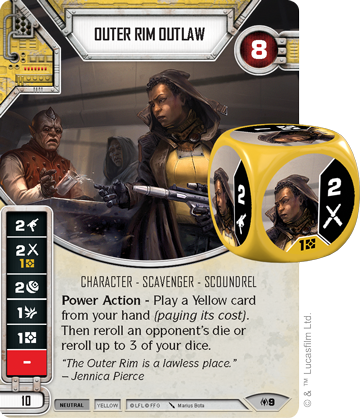 The strength of the Outer Rim Outlaw lies in their versatility, and in draft play they can slot into nearly any team. Ultimately, each of these three characters rewards you for playing cards of their color, something that you will likely be trying to do anyway. Each is a strong option in draft play, but they can also bring their efficiency to any constructed deck. If the above characters can’t fill a slot on your draft team, there is a fourth character found in Allies of Necessity—a shapeshifting reptilian certain to vex any foe. The Clawdite Shapeshifter (Allies of Necessity, 13) is a six-point neutral character that specializes in indirect damage. What's more, after you activate the Shapeshifter, you can choose a character subtype for this tricky charater to gain until the end of the round. Although subtypes have no inherent benefits, this will have strong synergy with the subtype-heavy Convergence booster packs, as well as within Allies of Necessity. 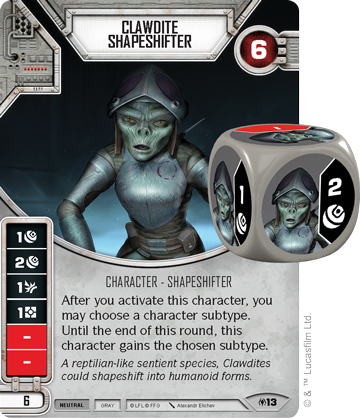 For example, any deck that includes the Clawdite Shapeshifter will also likely include Chance Encounter (Allies of Necessity, 14), which gives various benefits when you spot a leader, scoundrel, or trooper character. With the Shapeshifter, you can essentially choose the benefit that this card gives each round. Furthermore, the other three characters in Allies of Necessity each correspond to one of these subtypes, making Chance Encounter a valuable tool to include in nearly any situation. 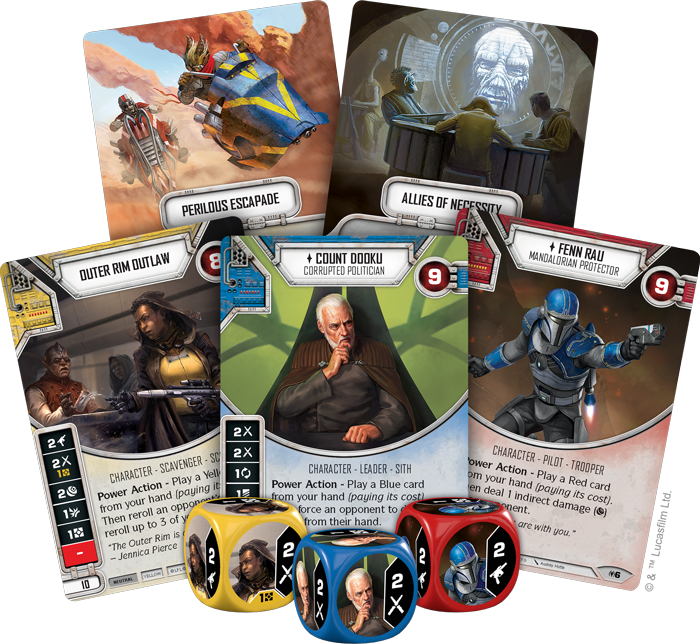 As another difference from the Rivals Draft Set, Allies of Necessity includes multiple plot cards to further help you customize during deckbuilding, including the game’s first -2 point plot. Allies of Necessity (Allies of Necessity, 16) comes with a crippling restriction, but desperate times call for desperate measures. Starting a game with no resources and one less card in your hand puts you at a distinct disadvantage, but if you can recover, a 32-point team could be difficult for anyone to defeat in the late game. Can your allies of necessity overcome the odds and band together to stop your foes? With a galaxy constantly at war, no one can survive on their own. 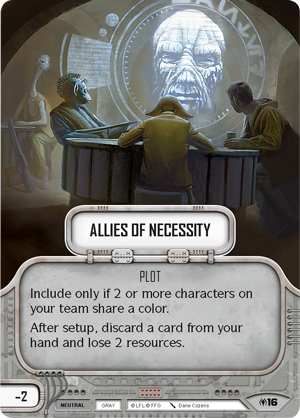 Forge a new alliance with the Allies of Necessity Draft Set, coming the second quarter of 2019! Prepare for war and pre-order the Allies of Necessity Draft Set (SWD17), available now for pre-order from your local retailer or our website!